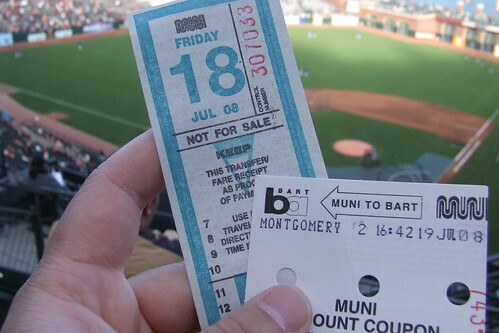 One of my former co-workers left me a comment about my recent posting about tips for rookies on BART and stated: "You should write a list of demands of MUNI and get them published in the newspaper. Or, write them out and nail them to the director of MUNI's door (like Martin Luther)." Regaining the trust of the public with a reliable and efficient transportation service. The immediate resignation of SFMTA Chief Nathaniel Ford, and union leader Irwin Lum. The citizens of San Francisco reserves the right to vote for the Executive Director of the SFMTA versus the appointment by the Mayor. Faster buses than the average eight miles per hour. Investment in new Muni metro vehicles with extensive testing to assure no breakdowns, but must also be cost effective. Investment in high capacity, double articulated buses to serve major transit corridors. Increase in speed on the Twin Peaks Tunnel segment between Castro and Forest Hill. Addition of more historic trolleys or purchasing of low floor trains on the F-Market. Creation of express bus lines for mid-day and Saturday service for areas west of 19th Avenue (Sunset) and Park Presidio (Richmond). Increased police presence on all Municipal Railway vehicles. If that doesn't work, a dedicated transit police should be used. The swift termination of employees who have been found responsible for major vehicular and pedestrian accidents, and ones with too many complaints. Immediate clean-up of vehicles with graffiti and investment into ways graffiti can be easily erased without "ghost" graffiti still present on surfaces. The end of the bureaucratic red tape that has stalled major projects to improve transit. Improved maintenance of transit vehicles including more preventative maintenance. Having backup vehicles prepared at key locations around the city when a vehicle breaks-down. A knowledgeable 311 staff specifically dedicated to Muni; must have full understanding of system and policies, and when complaints must be addressed immediately versus the next business day. Assure operators of no retribution or punishment for confronting passengers; such as passengers playing music too loud. Installation of pre-paid fare machines at major transit stops to create quicker boarding. Eliminating bus stops that stop every block; should be changed to once every two blocks (minimum). Weekend service hours at the SFMTA Customer Service Center at Van Ness/Market. Want to add to this list? Just post a comment. As much as I love a lot of the things on this list, some are a little far fetched... Like a miracle substance that cleans away graffiti perfectly? How is that going to happen when muni can't even afford itself let alone a research and developement department? Ask a company that focuses on cleaning products to look into that, not Muni. -All revenue from mass transit and additional money voted on by taxpayers goes to pay for direct operations and expansion. -When BRT is established on Geary, lay light rail tracks at the same time so the city doesn't need a second major pass at construction. -My long term wish would be a means of getting north to south from the west side of the city, ie a MUNI line running parallel to 19th Ave from the Richmond Dist south to meet up with M to Balboa Park BART (or even better, down to Daly City). -They need to have underground/direct connections for the T-line extension as well as the new Transbay Terminal into existing infrastructure. If I have to go up 2 sets of stairs and then walk a block and go down into another station, that's a huge waste of time. As far as speeds, I think having stops every 3 blocks or so (at least that's my experience from the 38-Geary) is fine, but most buses shouldn't be locals. The 38-Geary has something like a dozen buses an hour or more, and the majority of them are locals. you should flip the frequency of the local and the limited, and add an express that runs all non-owl hours that, for the Geary run, stops maybe 4 places -- 30-something Avenue, Park Presidio, Divisadero, Van Ness, and Transbay Terminal. "As much as I love a lot of the things on this list, some are a little far fetched... Like a miracle substance that cleans away graffiti perfectly?" Anon, there are other ways to prevent graf from persisting - a really effective means to deter scratch/acid etching has been those polymer sheets that are affixed to the surface of windows. While you couldnt cover every surface in a bus with them, you could definitely try covering the hot spots - broad planes and such. This makes graf removal as basic as peeling off the sheet and placing a new one. This would also help deter those halfassed mailing label tags. However, considering SFMTA's demonstrated commitment to halfassedness in maintenance, on both vehicle and in stations, im sure it would be considered "too much work"
give the T line preferential treatment at lights along 3rd; from 3rd and Evans to the Embarcadero is 45 minutes. that is out of hand. This too might seem far fetched, but I think it's important: uniforms. Too often I see a Muni man dressed not unlike the people he's transporting. I know there are uniform standards (there's one guy on the 38 who wears it to a "T") and these need to be enforced rigorously. A professional looking workforce would go a long way in helping Muni engender themselves with the public. Shirts tucked in, jackets, hats, PROPER shoes that are shined! Do away with those laughable neon yellow 'safety' vests and write up those who do not follow the standards. Small steps make big changes. There needs to be a clear policy for what to do when Muni vehicles are bunched. Consolidate on the front vehicle if there's room and have the one behind wait 5 minutes to start again. Or have the front one stop making pick-ups and only do drop-offs. Also, we should do like they do in London and have local and long-distance buses. They have routes that only go between a neighborhood and the nearest shopping area and then loop. Routes that go all the way across town have a tendency to get off schedule. I mostly ride the Metro underground, so I especially agree with fixing the problems outbound between Castro and West Portal. That derailment was years ago, and trains are STILL running at 20mph or less. They even had a two-year project at night and didn't fix this! When I got home from work on Wednesday night, there were two different problems being blasted onthe PA--an inbound and and outbound mechanical delay. These have got to be addressed.